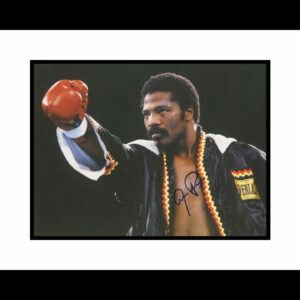 Framed 16×20 signed photo of boxer Aaron Pryor. 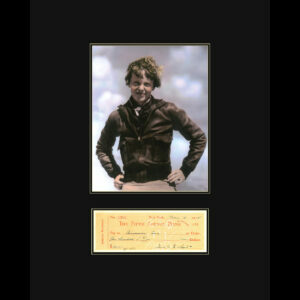 Comes with COA and photo of signing. This photograph and check entitled “Gambino.” Carlo “Don Carlo” Gambino (August 24, 1902 – October 15, 1976.) Gambino was a Sicilian-American mobster and boss of the Gambino Crime Framily, which is still named after him. After the 1957 Appalachian Convention, he unexpectedly seized control of the Commission of the American Mafia. In 1937 Gambino was convicted of tax evasion but had his sentence suspended. 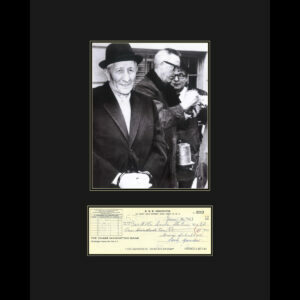 Also featured, is a reproduction of a personal check signed by Carlo Gambino. 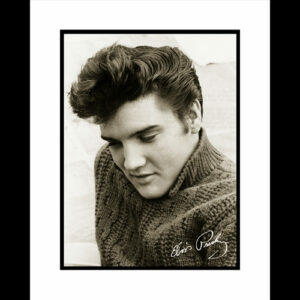 This framed 16×20 fuji crystal archival Elvis Presley photograph is entitled “Elvis 68.” Usually referred to as The ’68 Special or The ’68 Comeback, the actual name of this landmark television special was Elvis. 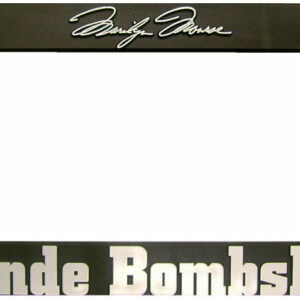 Taped in June 1968, it first aired the following December 3rd on NBC-TV. 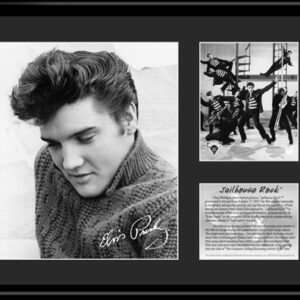 It stands as one of the great television moments in rock music history and a stunningly brilliant milestone in Elvis Presley’s career. 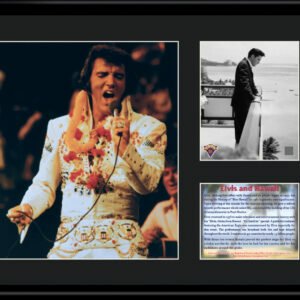 This 11×14 limited edition collectible lithograph features shots of Elvis from “Hawaii.” Elvis’s lifelong love affair with Hawaii and its people began in 1957, but during the filming of “Blue Hawaii” in 1961 it gained new significance. Comes matted and framed. October 17, 1957. The film opened nationally in November and quickly went to the top five at the box office. In the years to follow, it will come to be considered the ultimate classic of “rock opera” movies. 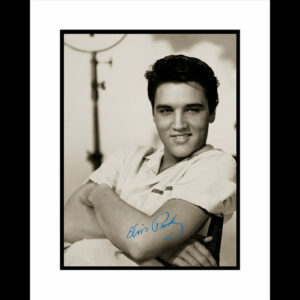 This 11×14 limited edition collectible lithograph features shots of Elvis from his fourth motion picture “King Creole” which was filmed from January to March 1958 just before being inducted into the US Army. 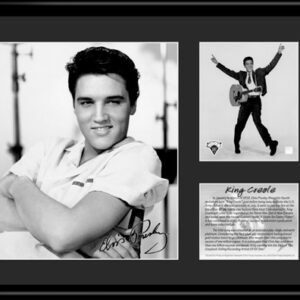 Of the thirty-one feature films Elivs starred in, King Creole will come to be regarded as his finest film. Facsimile SIgnature. Comes matted and framed. 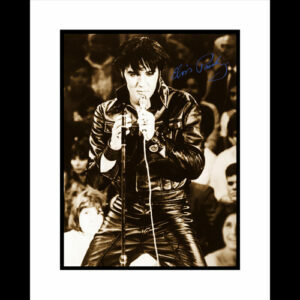 16×20 Framed Elvis – King Creole. 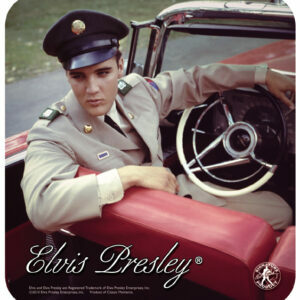 This fuji crystal archival Elvis Presley photograph is entitled “King Creole.” From January to March of 1958, Elvis Presley filmed his fourth motion picture, “King Creole.” When it opened nationally in July, it was in the top five at the box office. Set in New Orleans and based upon the Harold Robbin’s novel “A Stone for Danny Fisher,” it has continued to enjoy financial success in television syndication and home videos. 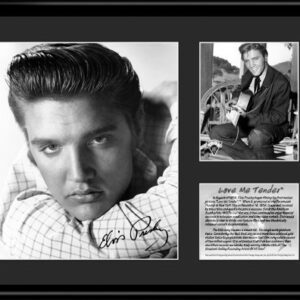 This 11×14 limited edition collectible lithograph features shots of Elvis from his first motion picture “Love Me Tender” which premiered at the Paramount Theater in New York CIty on November 16, 1956. Facsimile Signature. Comes matted and framed.